New research of 35 leading multinational companies by the World Federation of Advertisers shows that the last year has seen a sea change in media governance practices, as brands grapple with issues including transparency, ad fraud and brand safety. The study, which surveyed 35 companies with a combined global marketing spend of more than $30bn (£23.3bn), found that a large majority had changed their practices in one or more ways. Many of the changes, the WFA said, had been triggered by a report last June from the US Association of National Advertisers that identified widespread non-transparent business practices. The ANA followed this up with a new report last week, which made clear that problems remained. More than 70% of respondents said they had amended their contracts with media agencies in an attempt to improve transparency, while 65% have improved their internal capabilities, such as by hiring a head of programmatic. Changes that brands have made to their media agency contracts include the addition of media/financial audit right clauses (29%), contractual clauses for the return of incentives (26%) and data ownership clauses (32%). A determination to tackle ad fraud, meanwhile, has seen 43% shift away from CPM as their key metric in favour of business outcomes, with 40% developing in-house resources against ad fraud. Almost three quarters (74%), meanwhile, have suspended investment in ad networks where they felt there was an unnecessary risk to their brands, while a further 14% plan to do so. The same total either currently limit or plan to limit investment in ad networks that do not allow use of third-party verification. 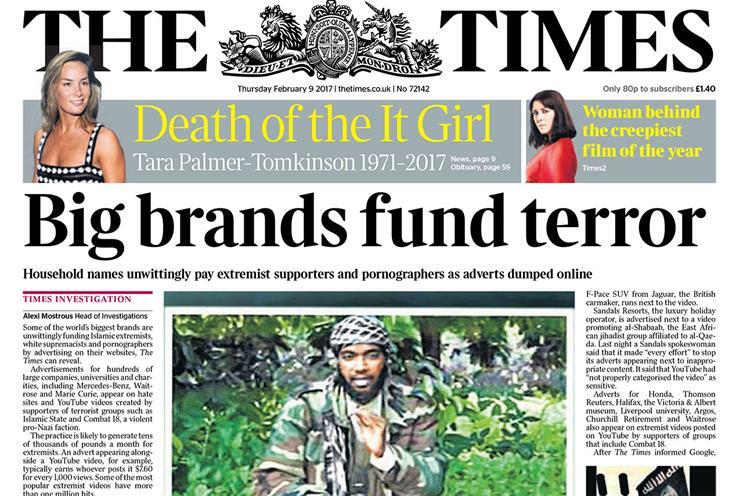 Six months after a series of brands suspended their advertising on YouTube after an investigation by The Times found ads for major brands running next to extremist content, the research found that brand safety was climbing the agenda of concerns. Transparency was named as the biggest priority for 47% of those questioned; 51% say it has moved up the priority list, while 14% said it was de-escalating. But brand safety, the second most pressing issue, has grown in significance for 70% of respondents. On viewability, 63% are now only investing in viewable impressions that meet industry standards, and 37% have devised their own viewability criteria. Robert Dreblow, head of marketing services at the WFA, said: "The WFA has long championed the need for clear and transparent relationships between brands and their agency partners. "Last year’s ANA report was a catalyst for a new wave of action by brands not just in the US but around the world, addressing many of the media issues that our members have highlighted including brand safety and ad fraud. "These actions, coupled with an increasing number of WFA members sharing that they have witnessed improved transparency, are positive signs that we can create an improved media landscape for brands, agency partners and media owners." Transparency, viewability, third-party verification and ad fraud moved to the top of the agenda in the global marketing industry in January, following a landmark speech given by Procter & Gamble chief brand officer, Marc Pritchard, to the US IAB Annual Leadership meeting in January. But in a letter this week to Facebook and Google, Paul Bainsfair, the director-general of the IPA, accused the digital media "duopoly" of being too slow to tackle the threats facing advertisers.